The voters’ expectations will now force AAP to think big. The virtual absence of an Opposition, an idea new to the Delhi assembly, has been seen elsewhere before. 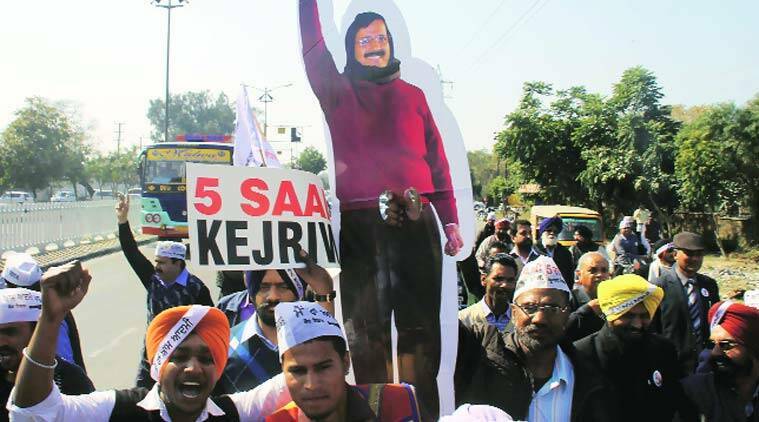 What will test the AAP government are issues specific to Delhi — as well as the gigantic burden of public expectation that this verdict has put on the party. 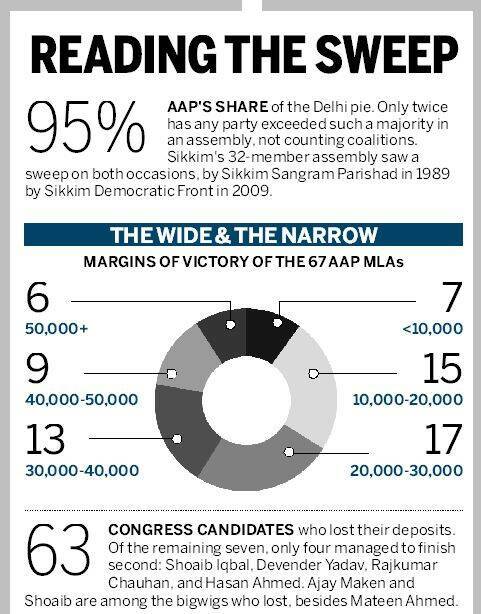 The AAP’s 67 seats give it an almost 96 per cent majority in the assembly — a performance bested only by Pawan Kumar Chamling’s Sikkim Democratic Front, which had 100 per cent seats in the 32-member Sikkim assembly after the elections of 2009, and before that by Sikkim Sangram Parishad in 1989. After the earlier elections in 2004, the opposition had one MLA in the Sikkim House. The AAP was formed in 2012; N T Rama Rao’s Telugu Desam Party is the closest example of a newbie party sweeping the assembly. Within a year of its founding, the TDP and its allies won 214 of 294 seats in Andhra Pradesh, the TDP getting 54 per cent of the vote on its own. Tamil Nadu is among the big states that have seen wipeouts. In the June 1991 assembly election, held just after Rajiv Gandhi was assassinated, the incumbent DMK was reduced to 2 seats as the AIADMK-Congress swept the polls. The DMK hit back strongly in 1996, winning 173 of the 234 seats — or 74 per cent of the assembly — by itself. In West Bengal, the Left Front secured more than 50 per cent of the vote in 1982 and 2006. In 2006, it won 235 of the 294 seats — nearly 80 per cent of the assembly. In Gujarat, the BJP won its biggest mandate in 2002 — 127 of 182 seats, or 70% of the assembly. Orissa in 2014 gave the Biju Janata Dal 117 of the 147 seats — 80%. Among the smaller states, in Tripura, the Left has won over 50 per cent of the vote in 2008 and 2013, leaving the Opposition with only 10 out of 60 seats in both elections. Tuesday’s verdict will not change the fact that the 69th amendment of the Constitution gave Delhi the status of only a semi-state, and that The Government of NCT of Delhi Act, 1991, makes it clear that the remit of the state government is limited. The faith reposed by voters will force AAP to think big and be seen as a government with can-do. The absence of an opposition in the assembly will conceivably enable it to pass endless legislation, at least some of which can be, however, expected to slow down at the Lieutenant-Governor’s office. Most promises of AAP, beginning with lower power and water tariffs and women’s safety, could involve a clash of jurisdictions with the Centre. And the chief minister can spend, at most, Rs 40,000 crore annually without having to go to the Centre for clearance. “Complex negotiations with the Centre and neighbouring states like Haryana and UP for power and water needs would need working with, rather than working in opposition to, authorities there,” a senior officer who worked with the Delhi government until 2012 said. Land, public order and the police are areas kept out of Delhi’s control. But they are central to fulfilling many of the promises made by AAP — such as 20 more schools in each constituency, and housing for the poor. Negotiations with the Centre will be involved, and the Centre will have the opportunity to delay or stymie plans. Development economists argue that the successes of literacy programmes, decentralisation and health schemes in Kerala, or the efficiency of healthcare and public distribution systems in Tamil Nadu, owe not so much to strong governments as to alternating verdicts and strong oppositions — and to the bipartisan consensus on the need for welfare programmes.